FEA may be used to analyze single as well as multiple body designs. For multiple body analysis the interactions and restraints between bodies must be defined. The solver can then provide the resulting displacement, stress and contact pressure plots. Utilizing multiple bodies is typical of connection or joint analysis and allows the user to ensure proper preload and observe that joint separation does not occur. A complete engineering report of a multi body analysis typical of what is provided by Pressure Vessel Engineering is available for download below. Interaction between multiple bodies can be defined as bonded, no interaction, or no penetration. A bonded condition forces the bodies to act as a single component. For example a head bonded to a shell would simulate a welded condition and solve the analysis as if the head and shell were a single component. A no interaction condition does not account for the interaction between multiple bodies; it allows the bodies to displace individually without any imposed restraints by the adjacent components. This condition could result in bodies interfering or overlapping each other. A no penetration condition allows multiple bodies to contact each other, but not to penetrate. This condition is useful when analyzing connections such as flanges, tri-clamps or split rings. No penetration conditions also provide contact pressure plots. These plots are useful to ensure joint separation does not occur. A contact pressure plot showing resulting contact pressure between bodies. This plot is useful to ensure joint separation does not occur. the length and color of the arrows shows the contact pressure. Restraints between multiple bodies such as bolts may also be simulated. Bolt connectors are defined in place of solid model bolts, and their material properties and preload defined. 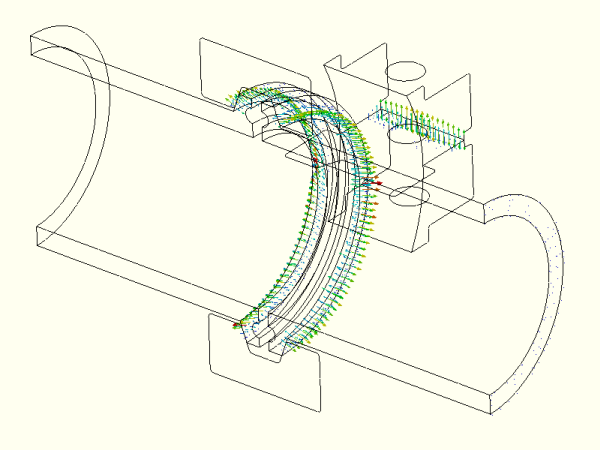 The solver creates beams to simulate bolting where bolt connectors have been defined, and transfers the applied preload to the connection accordingly. The software can then output the resulting forces acting on each connector which can then be used to calculate stresses. Defining appropriate restraints and interactions between bodies is critical to obtain accurate FEA results. Applying incorrect interaction conditions between components will result in incorrect results. 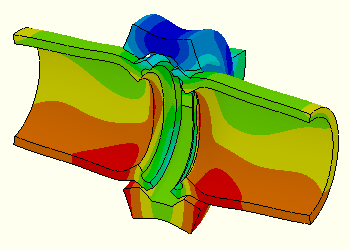 FEA results with the wrong interactions may be interpreted as acceptable and allow for unsafe designs.